Donald Trump officially became the Republican nominee for president at the Republican National Convention in Cleveland, Ohio, this week. Trump defeated 16 other candidates to win the nomination. The 4-day convention did not show as much unity as the nominee had hoped for. Trump’s campaign spent the first two days of the convention explaining accusations of plagiarism over a speech given by his wife, Melania. The speech contained similar sentences to ones in the speech given by first lady Michelle Obama at the 2008 Democratic Convention. Former competitors Marco Rubio, Chris Christie and Ben Carson joined other Republicans to support Trump’s candidacy. Both Christie and Carson spoke on Tuesday aiming strong criticism at the Democratic candidate Hillary Clinton. Rubio spoke in a taped message one day later. On Wednesday, Senator Ted Cruz of Texas spoke at the convention. He was Trump’s strongest opponent in a race for the nomination that many observers considered very divisive. Former House Speaker Newt Gingrich followed the Texas Senator. He said Trump understood the threat of Islamic extremism better than Hillary Clinton. He also addressed Cruz’s speech saying that, if people vote their conscience, they would support Trump. The controversy overshadowed the appearance of Indiana governor Mike Pence. He gave his acceptance speech as the party’s vice presidential candidate. Donald Trump has taken an untraditional path to win the nomination. He has never held a public office. Trump has spoken about the unemployment rate in America. During the campaign, he has said China, Japan and Mexico have taken those jobs. He said Mexico and other Latin American countries have sent illegal immigrants to the United States. Other candidates spent money to buy advertising during the primary elections. Trump spread his message and attacked opponents on free television, radio and social media. Supporters reach to great Republican presidential hopeful Donald Trump as he leaves a brief stop to speak to supporters and the media in Laredo, Texas, Thursday, July 23, 2015. Trump has made many controversial comments during the campaign. Speaking of Republican Senator John McCain, he said, “He’s not a war hero. … I like people who weren’t captured.” Senator McCain ran for president as a Republican in 2008. He was shot down during the Vietnam War and was tortured as a prisoner of war. Many Democrats and Republicans condemned Trump when he called for a ban on all Muslims entering the United States. Many criticized Trump for saying U.S. District Court Judge Gonzalo Curiel cannot rule fairly because of his “Mexican heritage.” Curiel is hearing the case against Trump University. People who paid money to take real estate classes at Trump University are bringing a legal case against Trump. Others disagreed when Trump praised former Iraqi dictator Saddam Hussein for killing terrorists. Trump was born June 14, 1946, in Queens, New York. He graduated from the New York Military Academy and later completed a study program at the Wharton School of Finance at the University of Pennsylvania. Trump started in business by working for his father who was a wealthy real estate developer in Queens. During New York’s financial crisis, Trump received reduced taxes from the city to build a hotel in Manhattan. The deal was the first of many projects for the developer -- from casinos to golf courses. From left, Donald Trump, Mayor Ed Koch and Gov. 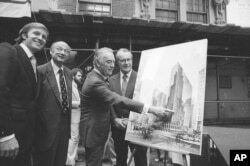 Hugh Carey at the site of the New York Hyatt Hotel/Convention, June 28, 1978. For a short period, Trump owned a sports team and a small airline company. In 1991, he sought bankruptcy protection when some of his businesses did not make enough money to pay the loans. It was the first of four bankruptcy filings by Trump companies. Trump used his name to sell neckties, water, wines, steaks, books and magazines. He launched the reality TV show, “The Apprentice,” and produced a business seminar called Trump University. In the 1990s, Trump’s name became a headline for New York’s newspapers when he divorced his first wife, Ivana, and married Marla Maples, a little-known actress. He is now married to Melania Knauss, a former model from Slovenia. The businessman has five children by three wives.